Click image to view a video. "A colored child born April 1, 1854, son of Peter Tolton and Martha Chisley, property of Stephen Elliott." Those were the words written in the baptismal record for Father Augustus Tolton. 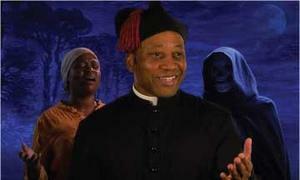 Born a slave in Brush Creek, Mo., he grew up to become the first African-American Catholic priest. He bore the insults of racial prejudice, and even after his ordination suffered the jealousies of religious leaders, both Catholic and Protestant, who saw him as a threat to their congregations. Tolton: From Slave to Priest is sure to have a powerful impact on all who experience it. From his dramatic escape from slavery to his courageous struggle in the face of prejudice, Father Tolton’s life centers around his message of reconciliation and hope which is both a message for his time and our own. This live production is performed by actor Jim Coleman. This show performed by Saint Luke's Productions is brought to us by The Catholic parishes of the River Bend Community, the St. Serra Vocations Club of Madison County, and Marquette Catholic High School.